Review by AllTheBestFights.com: 2017-07-01, nice and tough exchanges between Michel Soro and Brian Castano: it gets three stars. Michel Soro entered this fight with a pro record of 30-1-1 (20 knockouts) and he is ranked as the No.7 super welterweight in the world (currently the #1 in this division is Erislandy Lara). He suffered his only loss when he faced Zaurbek Baysangurov in 2012, since then he has collected 12 victories and one draw beating Nuhu Lawal (=Soro vs Lawal) and Javier Francisco Maciel in his last two (=Soro vs Maciel). His opponent, the undefeated Brian Carlos Castano, has a perfect boxing record of 13-0-0 (10 KOs=77%) and he entered as the No.35 in the same weight class. He fought twice last year winning over Marcus Upshaw and Emmanuel de Jesus. 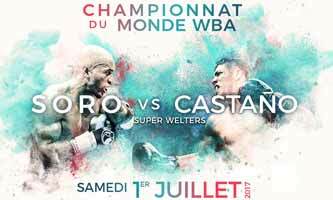 Brian Carlos Castano vs Michel Soro is valid for the interim WBA World super welterweight title. Watch the video and rate this fight!